How I’m voting Tuesday for Oakland Mayor: #1 Libby Schaaf, #2 Rebecca Kaplan; Oakland Auditor: Len Raphael; California proposition 46: No, 47: Yes. In 2010 I ranked Kaplan first among a very weak field. Jean Quan won; my recommendations/predictions for her tenure still seem pretty reasonable. Schaaf’s position on public safety seems nearest to my plea: more quality and quantity, with priority to former. That seems approximately the position of the other two likely winners (Kaplan and Quan); the real question is delivery. Progess has been way too slow under Quan, starting with many mistakes. With Kaplan I can’t tell where bluster about “leadership” ends and effectiveness begins, but I suspect it is mostly bluster. The other candidates with a nonzero chance of winning strike me as prioritizing quantity (Bryan Parker, Courtney Ruby, and especially Joe Tuman) or quality exclusively (Dan Siegel). Schaaf’s approved plan for adjustable/benefit parking pricing in Montclair. Flexible pricing for parking is always a tough sell, but absolutely the right thing to do, and one of the most impactful and beneficial things a city can implement. I hope that Oakland catches up to and preferably leapfrogs SFPark and suspect that is most likely if Schaaf wins. Tuman is the worst on this issue, wanting to increase gratis parking. Schaaf has done more work on ‘open’ government than any of the other candidates; my expectations for progress in that area would also be higher if Schaaf wins. The other candidates have a tendency to come off as blowhards (especially Kaplan), incoherent (especially Quan), or some combination. For the field, Schaaf is on the low end of both of these negative characteristics. I expect fewer cringe-inducing moments from a Schaaf mayorship, a slightly good thing even if it has no correlation with effectiveness. There is one issue that Kaplan, Quan, and Schaaf seem to approximately have the same position on, but Kaplan might be better: building a substantial amount of new housing. Kaplan has said that Oakland could have 100k more people. Not nearly enough, but a large number that I’m pleasantly surprised I have not seen criticism of. I don’t think any of the candidates take a reasonable (kick them out) position on the embarrasment of professional sports teams in Oakland. I have not investigated their positions closely to avoid triggering disgust reaction, but my gloss: Parker and Tuman most likely to beggar the city to sports team owners, Kaplan extremely eager to claim credit for keeping sports teams, city hall plastered with cheesy corporate sports team banners under Quan, Siegel possibly least likely to totally sell-out to team owners. Lots more about the Oakland mayor contest at OaklandWiki. An issue I don’t think any candidate has addressed. There are only two candidates for Oakland auditor. 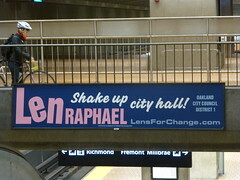 I’ll vote for Len Raphael, as I did when he ran for councilor in my district in 2012. Raphael would do politically unconfortable audits. Brenda Roberts would be business as usual. Especially for a city as poorly governed as Oakland, the former is necessary. There hasn’t been much coverage of this contest, but a recent article in the East Bay Express seems like a neutral summary. Read more at OaklandWiki. Ending the insane drug war continues to be the sure thing most governments could do to increase local and global peace and justice. There’s one California state proposition that would expand the drug war: 46: Medical Malpractice Lawsuits Cap and Drug Testing of Doctors (vote against), and one that would mitigate it 47: Reduced Penalties for Some Crimes Initiative (vote for).